As of today, we have exactly 50 days left in the 2018-2019 school year! My school goes all the way through to the end of June, nearly a month later than my library and teaching friends in Texas get out of school. Last week, we asked our students color 50 summer-themed paper chains, and starting this afternoon, we will clip one paper chain each day. I am so excited to get to the last paper chain! That will mean that my school librarian position has officially ended, and I will be able to focus on homeschooling my boys and growing MrsReaderPants FULL-TIME! I keep calling it "early retirement," but in reality, I'll still be plenty busy with homeschool and growing my blog. I am sooo excited about the possibilities for this blog--my head is overflowing with ideas! 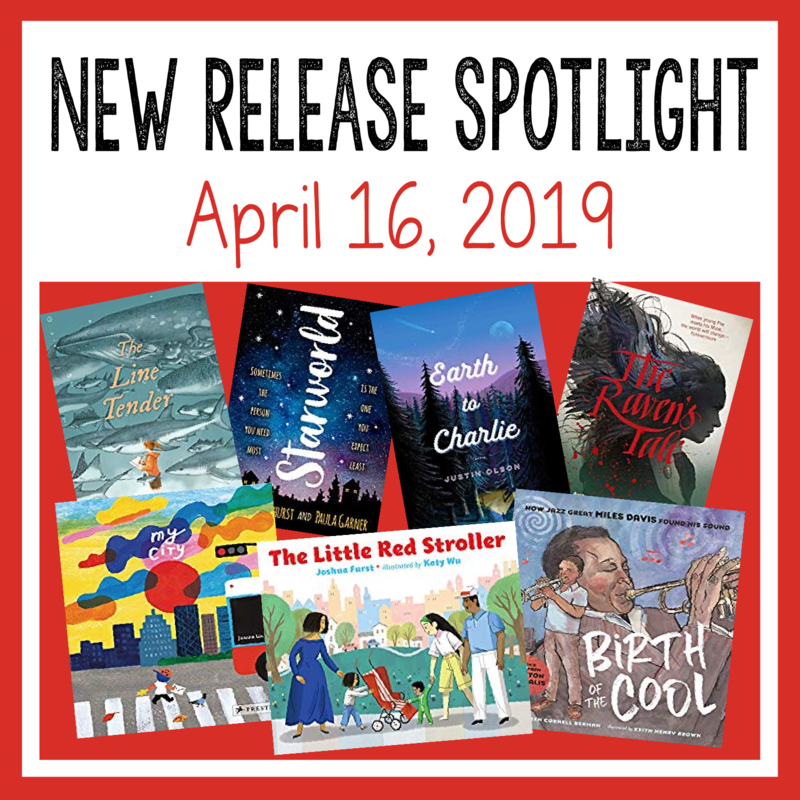 I've found 14 notable new releases this week, mostly in the YA and picture book categories. As a big fan of Edgar Allan Poe (thanks, Dad! ), I can't wait to read The Raven's Tale, which gives Lenore in "The Raven" her own voice! How cool is that?! And there's also a middle grade book featuring a backdrop of shark study and marine biology (I also love sharks!). Set on the shores of Lake Superior, Wreck follows high school junior Tobin Oliver as she navigates her father's diagnosis of ALS (Lou Gehrig's Disease). Steve's life as a paramedic and a runner comes to an abrupt halt just as Tobin is preparing her application for a scholarship to art school. With the help of Steve's personal care assistant Ike, Tobin attends to both her photography and to Steve as his brain unexpectedly fails right along with his body. Sam Jones and Zoe Miller have one thing in common: they both want an escape from reality. Loner Sam flies under the radar at school and walks on eggshells at home to manage her mom's obsessive-compulsive disorder. Popular, people-pleasing Zoe puts up walls so no one can see her true self: the girl who was abandoned as an infant, whose adoptive mother has cancer, and whose disabled brother is being sent away to live in a facility. When an unexpected encounter results in the girls' exchanging phone numbers, they forge a connection through text messages that expands into a private universe they call Starworld. Mystery-book aficionado Birdie Lindberg has an overactive imagination. Raised in isolation and homeschooled by strict grandparents, she's cultivated a whimsical fantasy life in which she plays the heroic detective and every stranger is a suspect. But her solitary world expands when she takes a job the summer before college, working the graveyard shift at a historic Seattle hotel. The hotel's charismatic young van driver Daniel Aoki shares the same nocturnal shift and patronizes the waterfront Moonlight Diner where she waits for the early morning ferry after work. Daniel also shares her appetite for intrigue, and he's stumbled upon a real-life mystery: a famous reclusive writer--never before seen in public--might be secretly meeting someone at the hotel. Seventeen-year-old Edgar Poe counts down the days until he can escape his foster family--the wealthy Allans of Richmond, Virginia. He hungers for his upcoming life as a student at the prestigious new university, almost as much as he longs to marry his beloved Elmira Royster. However, on the brink of his departure, all his plans go awry when a macabre Muse named Lenore appears to him. Muses are frightful creatures that lead Artists down a path of ruin and disgrace, and no respectable person could possibly understand or accept them. But Lenore steps out of the shadows with one request: "Let them see me!" Jess has always struggled with the fire inside her. But when she meets Vivi, everything changes. As they fall for each other, Vivi helps Jess deal with her anger and pain and encourages her to embrace her artistic talent. And suddenly Jess's future is a blank canvas, filled with possibilities. When Vivi unexpectedly dies, Jess's perfect world is erased. As she spirals out of control, Jess pushes away everyone around her and throws out her plans for art school. Because art is Vivi and Vivi is gone forever. Fiona claims she doesn't remember anything about the night her best friend Trixie left a party and walked into the ocean. It's ruled a suicide, but Fiona doesn't believe her Trixie is really dead--and she is determined to find out why Trixie would want everyone to think she is.Fiona enlists the help of Trixie's former best-friend-with-benefits, and their search for the truth leads them toward another suicide case in their small, ocean-side town. But the closer Fiona gets to finding out what happened, the more she realizes that she might not have known her best friend at all. Convinced his mother has been abducted by aliens, Charlie Dickens spends his nights with an eye out for UFOs, hoping to join her. After all, she said the aliens would come back for him. Charlie will admit that he doesn't have many reasons to stick around; he doesn't get along well with his father, he's constantly bullied at school and at work, and the only friend he has is his 600-pound neighbor Geoffrey, and Geoffrey's three-legged dog, Tickles. Then Charlie meets popular, easy-going Seth, who shows him what real friendship is all about. For once, he finds himself looking around at the life he's built, rather than looking up. But sooner than he expected, Charlie has to make a decision: should he stay or should he go? A true daughter of the fearsome O'Malley clan, Grace spent her life wishing to join the fight to keep Henry VIII's armies from invading her homeland of Ireland--only to be told again and again that the battlefield is no place for a woman. But after English conspirators brutally murder her husband, Grace can no longer stand idly by. Leading men into battle on the high seas, Grace O'Malley quickly gains a formidable reputation as the Pirate Queen of Ireland with her prowess as a sailor and skill with a sword. But her newfound notoriety puts the lives of Grace and her entire family in danger and eventually leads to a confrontation with the most powerful woman in England: Queen Elizabeth I. Debut author! Wherever the sharks led, Lucy Everhart's marine-biologist mother was sure to follow. In fact, she was on a boat far off the coast of Massachusetts, collecting shark data when she died suddenly. Lucy was seven. Since then Lucy and her father have kept their heads above water-thanks in large part to a few close friends and neighbors. But June of her twelfth summer brings more than the end of school and a heat wave to sleepy Rockport. On one steamy day, the tide brings a great white-and then another tragedy, cutting short a friendship everyone insists was 'meaningful' but no one can tell Lucy what it all meant. As a young musician, Miles Davis heard music everywhere. This biography explores the childhood and early career of a jazz legend as he finds his voice and shapes a new musical sound. Follow his progression from East St. Louis to rural Arkansas, from Julliard and NYC jazz clubs to the prestigious Newport Jazz Festival. Rhythmic free verse imbues his story with musicality and gets readers in the groove. RECOMMENDED FOR: ranges from Grades 1-7--versatile! A young boy discovers the excitement and unexpected delight of exploring his city - and so will readers of this vibrant picture book. Max is asked to mail a letter for his mother. As he walks through his neighborhood in search of a mailbox, he encounters all sorts of interesting things like falling leaves dancing in the wind, skyscrapers towering in the distance, and junk being piled into a garbage truck. All around him adults hurry on their various errands, too busy to appreciate these wondrous details. His walk through the city leads Max to discover that the mailbox is actually right next door to his own house. My favorite food! This would be fun to pair with YouTube video of extremely slow-motion popcorn popping. With photographs illustrating every stage, readers get a behind-the-scenes view of how popcorn is planted, grown, harvested, processed, tested, and finally shipped to stores and movie theaters all over the world. Back matter delves into the history of popcorn and how it became so popular in the United States. When Luna is born, her mommy gives her a little red stroller. It accompanies her and her mommy through all the activities of their day, until she outgrows the stroller and is able to pass it down to a toddler in her neighborhood who now needs it. And so the stroller lives on, getting passed from one child to the next, highlighting for preschool readers the diversity of families- some kids with two mommies, some with two daddies, some with just one parent, and all from different cultures and ethnicities. 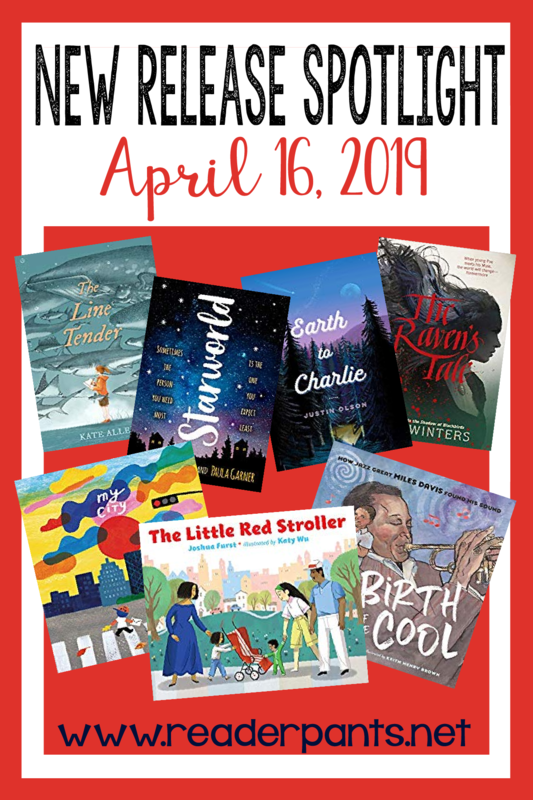 Need a new book for Earth Day next week? Check this one out! Pair it with Wangari's Trees of Peace (Winter). Enjoy your last 50 days! Thanks for the reviews. Thanks, shades! It's funny how much more creative I feel in this last stretch! Less stress, maybe? Wait, what's this about early retirement and staying home to homeschool your boys??? Does that mean you are moving back to Texas this summer? So glad you are planning to grow your blog! I love Mrs. ReaderPants and read every post and constantly refer to your reviews and new-release lists.